Author, Yves Engler, dubbed Canada’s Noam Chomsky and one of today’s most important voices on the Canadian Left, is the author of nine books and hundreds of enlightening articles. 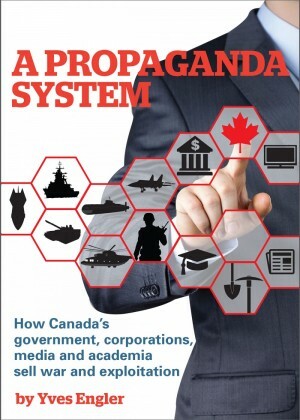 Engler’s engagingly-written and latest book A Propaganda System: How Canada’s Government, Corporations, Media and Academia Sell War and Exploitation highlights the dark sides of Canada’s real involvement in the world. His book reveals why most Canadians believe Canada is a force for good worldwide, despite its long history of supporting empire, racism and exploitation. Visiting Courtenay on Friday, Nov. 18, Laughing Oyster Bookstore (286 5th St. Courtenay) is hosting a book signing with Engler from 12-1pm. Then a Meet, Greet & Chat with Engler, sponsored by the Chapter takes place at Cornerstone Café, 1:15–2:30pm, following his appearance at Laughing Oyster. In A Propaganda System, Engler lays bare the links between corporations, government, media and academia, when it comes to establishing and maintaining Canada’s brutal foreign policy from helping to destabilize Haiti’s democratically elected government to backing the human rights-abusing Canadian-based mining companies. A Propaganda System clearly exposes the facts that run in stark contrast to Canadians’ popular notion that we are a peace-loving country. The Chapter welcomes you to join in a thought-provoking conversation with author Yves Engler Friday, Nov. 18 from 1:15 to 2:30 at Cornerstone Café – corner of 5th and Cliffe. This entry was posted in Corporate Rights Agreements, Council of Canadians, Democracy, Events by riverside11. Bookmark the permalink.